Welcome to this series of articles about Diabetes. Diabetes is a chronic disease that has reached epidemic proportions. However, it’s effects can be managed. It is believed that less than 30% of US adults get their recommended daily allowance of magnesium. That means when you are standing in a room with 9 other adults, at least 7 of you are magnesium-deficient. This is because of the prevalence of the Standard American Diet (SAD). When you eat the SAD, your body becomes sad in return. This is a diet where you eat lots of processed red meat, a range of dairy products, artificial sweeteners, processed foods, fried foods and baked goods, and you consume large amounts of refined sugar, salt and white flour. You frequently eat away from home, consuming a lot of restaurant food and fast food. You subsequently get very few fresh fruits, vegetables, unprocessed fish, beans and legumes and whole grains into your body. Looking at that definition of a SAD eating approach, you may notice this is the typical diet of most people in many modern, industrialized nations. This means the negative effects of the Standard American Diet can be seen in the typical men, women and children of Canada, the United Kingdom, Australia, New Zealand, Asia and other places where that unhealthy approach to nutrition is commonplace. This means a magnesium deficiency is found in most of the “western” world. If you eat an excess of processed foods and not too many fresh fruits and vegetables, you probably are not getting enough magnesium into your body to stay healthy. Coincidentally, the SAD eating approach also makes you more inclined to develop diabetes. Diabetes patients usually show low levels of magnesium. 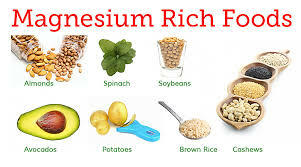 While people generally think of magnesium as a mineral most associated with strong bones and a healthy heart, researchers in the early part of the 21st century are finding magnesium impacts a wide range of healthy functions and physiological processes. This relatively new research shows that magnesium has been discovered in more than 300 different healthy enzymes in the human body. Some of those enzymes help regulate blood sugar levels. This shows that getting plenty of magnesium in the foods you eat, or taking a daily magnesium supplement, can prevent diabetes, and even reverse the condition. There are several foods which are approved for diabetic meal plans. Dark leafy greens, nuts and seeds, wild-caught fish, beans, legumes and whole grains are all foods that help reduce diabetes symptoms. You will also find those foods recommended in many healthy diet plans. The same is true for bananas, dark chocolate, avocados, yogurt without added sugar and other foods. One other thing all of those foods we just mentioned have in common is that they are high in magnesium. It is recommended that you get 400 mg of magnesium into your body every day. Eat the foods we just discussed, or take a daily magnesium supplement, and you could help prevent or reverse a diabetic diagnosis. For more blogs please go to www.NicksDigitalSolutions.com and choose Nicks blog. For E-Learning material, please go to www.NicksDigitalSolutions.com and choose E-Learning Shop and, in particular, the Health and Wellness or Seniors options. Nick Thorne is the founder of NicksDigitalSolutions Limited a company that specialises in Education, Training and Writing. He lives in Levin, New Zealand. Is Type 2 Diabetes dangerous? Is Type 2 Diabetes a Lifestyle Disease?